To examine the concept of reflection and perspective Danielle de Picciotto focused on a building in Detroit, Michigan. By using this building, De Picciotto reflects the world she is part of and puts it into her perspective. She combines images of the building in its new and decayed states, mirrors it with random FinalCut effects and Photoshop inserts, working herself and the viewer through a maze of images which all generate from this basic home. The beauty of the ensuing Kaleidoscope demonstrates the beauty possible in everything, even decay. This universe then is mirrored from different perspectives and a flow of transformation begins until at the end we are left once more with the simple house. Jesse Fleming has been producing engaging moving images for the last decade. His work manages to create a transcendent experience, luring the viewer in through a sophisticated craft, holding them past their expectancy, and bringing them to a new place of moment and presence. Fleming designs his work to elicit experiences of collective versus independent self, empathy, attunement, and group potential. He’s investigating a quality of non-self-referential experience through media and technologies that help lower the perceived boundary between self and other. Fleming has exhibited nationally and internationally in Los Angeles, New York, Austin, London, Barcelona, and has created films for the Museum of Modern Art, New York, The Guggenheim Museum, New York, The Getty Museum, Los Angeles, The Museum of Contemporary Art Los Angeles, and exhibited at The Hammer Museum, Los Angeles, The University of Austin Texas, and Borusan Contemporary in Istanbul. Fueling his transcendent media works as a Mindfulness practitioner, Fleming has eight years of meditation training and practice in Vipassana and secular Mindfulness, with a Degree in Mindfulness Facilitation from UCLA’s Mindful Awareness Research Center at The Semel Institute for Neuroscience and Human Behavior. This project records domesticated pigeon flocking through three different perspectives. Each perspective shares the same ambient stereo audio recording from the surrounding landscape using the birds and the city as an amphitheater. The first recorded perspective is from afar - a macro perspective focused on group behavior and the geometric renderings “drawn” by the group. The second perspective zooms into a closer view illustrating the structural web like contribution of each individual. The third and final view is from the perspective of the individual itself, giving the viewer the experience of flight - altering our relationship from observer to participant, identifying the contrasting relationship between the individual and the collective. The Berlin artist Philipp Geist (1976) works internationally as an artist since 1996 with the mediums of video/ light installation, photography and painting. In 2014, during the Year of Germany in Brasil 2013/2014, he developed an interrelated video installation on the universally recognized statue of Christ the Redeemer in Rio de Janeiro and projected it large-scale on the Santa Marta favela. On September 30 and October 1, 2014 and on the occasion of the 25th anniversary of the fall of the Berlin wall, he will implement a light art installation on the German Embassy in Prague and on the Bauhaus museum in Dessau in early September. Geist ́s projects are characterized by their complexity and integration of the location, the sound and moving images. In his video mapping installations, he avoids using canvasses and turns diverse architectures in moving, onlookers' perception of two- and three-dimensionality. Philipp Geist’s Riverine features video recordings of waters from different international locations. With underwater video cameras he films the world underneath the water surface. It is an attempt to get in touch with our immediate reality, an artistic examination with the ubiquitous element water. Geist manages to show a part of our reality that is usually hidden in front of us. Geist confronts the underwater worlds of the cities with each other. The clear water of one river is put in contrast to a canal full of thrown-away objects such as tins, street signs or even bicycles. A focus is put on the human exposure to the resource water in the different metropolises. aesthetics, they allow the viewer a real and also irritating insight. The previously known turns into a landscape of the surreal. Richard Jochum is a studio member of the Elizabeth Foundation for the Arts and associate professor of art and art education at Teachers College, Columbia University in the City of New York. He received his PhD in Philosophy from the University of Vienna (Austria) and an MFA in Sculpture and Media Art from the University of Applied Arts in Vienna (Austria). His art work is based in a variety of media, including video, photography and installation, and has been exhibited internationally in more than 100 group and solo exhibitions. He is represented by Gallery Lindner (Austria) and Gallery Bundo (South-Korea). More information can be found at richardjochum.net. Richard Jochum's Reflective Perspective (Crossword) takes the form of a typical crossword puzzle. Beginning with the familiar empty grid, the video invites studious attention. Over time the grid becomes filled with questions that are unanswerable, a puzzle that people can interact with and respond to, but only in their minds. Asking questions with no concise or concrete answers, questions with answers that could never possibly fit in the space provided by the typical crossword puzzle. The questions range from being about time, depth and perspective, philosophical or personal in nature. “Why is the sky blue? What are your biggest regrets? How many angels fit on the head of a needle?” are some examples. Jochum's Crossword uses a variety of languages to literally comment on observation, communication, and perspective through cultural space, as well as physical space. It reflects both the vertical projection space in which it will look displaced and therefore odd, and the theme: reflective perspective. Not cinematic, but invested with the medium and method of projection, a crossword puzzle is something one would expect to fill out in a magazine, not find on a wall in a museum. Robert Seidel (*1977) began his studies in biology before transferring to the Bauhaus University Weimar to complete his degree in media design. His projections, installations and experimental films have been shown in numerous international festivals, as well as at galleries and museums such as the Royal Museum of Fine Arts Antwerp, ZKM Karlsruhe, LACMA Los Angeles, and MOCA Taipei. His works have been honoured with various prizes, including the KunstFilmBiennale Cologne Honorary Award and Prize for Best Experimental Film at the Ottawa International Animation Festival. In his work Seidel is interested in pushing the boundaries of abstracted beauty through cinematographic approaches, as well as ones drawn from science. By the organic interplay of various structural, spatial and temporal concepts, he creates a continuously evolving complexity. With his second iteration vitreous, Seidel restructures the existing elements of nine virtual iridescent sculptures by adding gestural, fluidal and congealing interferences. The underlying nine sculptures resulted from experimental setups for generating three-dimensional clusters of fibrous refractions as well as the gravitational lensing of different volumetric and chromatic densities. Singular elements gravitate towards each other, accumulating in a gigantic sculptural system, even as each entity exists with its own visual axes and vanishing points. The impalpable luminous formations create prismatic interactions between the ridges and plateaus of the main colours floating in front of the infinite violet background. Eszter Szabó, born in 1979 Hungary lives and works in Budapest (HU) and Lille (FR). Her art explores two main areas: painting and video. The videos are based on her paintings which are water color on latex or oil on wood. 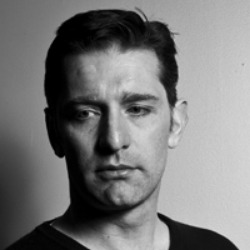 Szabó has been part of residencies in Paris, Germany and New York. She has had solo exhibitions at Taiss Galerie, Paris(FR), Jozsa Gallery in Bruxelles (BE) and Artists Unlimited Gallery in Bielefeld (DE). She currently shows with ACB gallery in Budapest and with Taiss Galerie in Paris. Dispenser of Delights is a video based on a series of paintings Eszter Szabó did on real estate advertisement photos printed from the internet. Szabó paints scenes on the photos featuring imaginary characters. We see them while they exercise self healing, rebirth, purification, being beautiful or simply just 'good'. Their means (tools) are miraculous and esoteric. These absurd time passings are charged with a strange mixture of religion, shamanism and international esotery. Curator Leo Kuelbs has presented dozens of artistic events around the world. Public art, luxury marketing, video art and multi-city programs are all part of Mr. Kuelbs’ internationally recognized practice. This combination of endeavors has garnered publicity in publications great (Vogue.de/Interview.de) and small (dozens of blogs in NYC and Europe). Mr. Kuelbs focuses on collaborative projects with an emphasis on conceptual infrastructure, approaching projects from multiple angles and perspectives. As a founding member and of 3_Search, Inc. as well as the driving force behind the Leo Kuelbs Collection, Mr. Kuelbs is poised to continue the development of this multi-perspective practice. Recent mapping-related shows include “The Diamond Sky,” in Spring of 2014, NYC, as well as “Submerged!,” in Budapest and NYC, also Spring of 2014. Previous projects include “Blueprints and Perspectives” (Dallas, Texas, 2013), “Illuminated Ops” (Washington D.C. 2013) “Codex Dynamic” presented on the Manhattan Bridge in 2012, as well as “The Expanding Universe” and “Divine Coalescence” for Dom Perignon. Karl Erickson is an artist whose interests include motivational language, transcendental experiences, science-fiction, raves, repetition and counter-cultures. His primary media are video, posters, collage and latch-hook rugs and pillows. In 2013 he was an artist in residence at The Arctic Circle and Lower Manhattan Cultural Council’s Swing Space Residency on Governor’s Island. Recent exhibitions include Monotonic Surfaces: An Account of the Arctic Regions” at Center for Strategic Art and Agriculture, “Andrew Falkowski and and Karl Erickson: Architecture and Morality” at the Suburban, Oak Park, IL, and “A Study in Midwestern Appropriation” at the Hyde Park Art Center, curated by Michelle Grabner. His videos have been and will be part of screenings at Creon Gallery in New York and Parsons Hall Project Space in Holyoke, MA. He received his MFA from California Institute of the Arts and his BFA from Wayne State University, Detroit, MI.